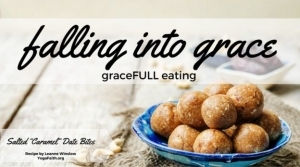 Welcome to Falling Into Grace! 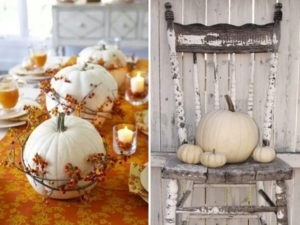 This is a weekly series to help you in not just a season change this fall, but a “chapter change”. We don’t know what that means to you, but we do know that God is doing something NEW and we don’t want to miss it. We know that what got us here today, is not going to work for what and where God is leading us into tomorrow. Thank you for coming along this journey with us as we, quite literally and figuratively “fall” into His amazing grace. We pray these weekly meditations each Monday throughout September will help you draw closer to the heart of God and His definition of grace. More importantly, how we can live it out in practical ways and be conduits of grace; extending freely what He so freely extends to us. *Please go day by day, don’t skip ahead. Absorb’s today’s word, activity and soul work. Simple elegance or refinement of movement. “she moved through the water with effortless grace” This reminds me of what we do in YogaFaith. Our body is our prayer, moving and flowing in His grace, is our worship. The free and unmerited favor of God, as manifested in the salvation of sinners and the bestowal of blessings. His grace is sufficient. Receive it today, this great grace! Grace piled upon grace! 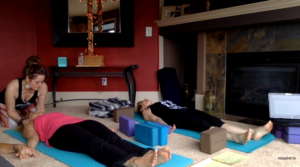 Monday’s Soul Work: Choose a Restorative Posture we recommend Modified Savasana [Resting Angel] as shown, with a block between the shoulder blades to lift and open the heart. Use a blanket and an eye pillow, enjoy His stillness in silence or play your favorite worship music. Remember, this posture is yes, a posture of exhaustion, but it’s also a posture of REST, COMPLETE SURRENDER and COMPLETE TRUST! 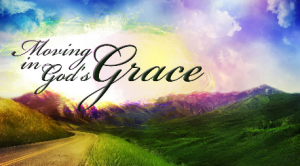 Tuesday’s Soul Work: Let His grace empower you to dwell in safety and rest securely…. (as integrated from above). As you go throughout your day or are laying your head down in a few minutes, remind yourself constantly: REST SECURELY. DWELL IN SAFETY. Then ask yourself, “Who else can I tell these 5 words to? Who needs to hear this message?” Commit to telling them face to face, a phone call or via text. Food is a gift from God. In Genesis 1:29 we see God give the gift of food. (And everyone said, “Amen!”)Then God said, “I give you every seed-bearing plant on the face of the whole earth and every tree that has fruit with seed in it. They will be yours for food.Though it is essential to survive, food and eating are also enjoyable. Next time you enjoy your favorite food, take a moment to truly view it as a gift, an expression of God’s grace. Thoughtfully choose what you will eat and to prepare it, treating it like the gift it is. When we look at food in the light of God’s grace and view it as a gift, we begin to consider what and how we eat. Do you think there are foods that help or hinder us in glorifying God? Do you think there are ways we can eat and prepare food that will do the same? Well, yes. Foods that provide nutrition and improve our bodies and minds will help us. Food that is prepared with intention, by hands that seek to love those who eat it, will maximize the benefit of eating that food. Whenever possible, prepare and eat food in community, sharing the table the Lord has provided. I wanted to share a recipe that would help us to feel blessed when we eat it, but also provide nutrition to build our bodies for God’s glory. This sweet treat is eaten during a time of feasting, when we fully receive the bounty of creation. I stayed true to what, maybe, Jesus would have eaten; dried fruits and nuts. No refined sugar, hydrogenated oils, or preservatives. 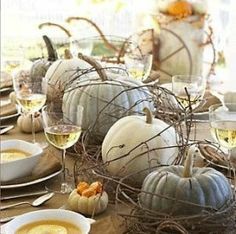 I invite you to prepare this treat with the intention to glorify God and to lovingly share it in communion with our brothers and sister and also non-believers. Lord, we are so grateful for your limitless love and grace. Though we are sinners who come to you filthy, you cleanse us so we can come into your light. Thank you for the gift of food, may we never take for granted the abundance you have blessed us with. As we enjoy the literal fruits in our lives, let us seek to be fruitful as we glorify you. Let us remember with each sweet bite, the sweetness awaiting us in your Kingdom. Amen. Salted “Caramel” Date Bites: Though not technically caramel, this combination delivers everything you love about caramel, from the silky texture to the sweet indulgence. This recipe is Vegan, Gluten-free, Low-fat, and Sugar-free and delivers fiber, a bit of protein, magnesium, vitamin B-6, and vitamin C.
Soaked dried fruit in warm water for 10 minutes, then drain. Place ingredients in food processor, pulse until mixture forms a paste. Scrape down sides of food processor as needed. Dip hands into cold water and roll mixture into bite-sized balls. Grace is not her luxury, it is her necessity. This is convicting to me. To be honest, I know that I need just as much grace as she does, but I just ‘get by’ most days. I want to live by God’s power, but I don’t ask. 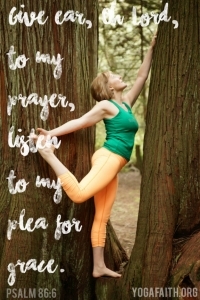 I also know this is true: when I step onto my yoga mat, God is always there to meet me. To witness his power in my weakness, I just need to ask him to give ear. How often we forget. God led Noah and his boat, the Israelites in the wilderness, the lambs by the waters, and Paul’s ship to shore. Thursday’s Soul Work: Write on a piece of paper, or journal, what God has graced you to do? Maybe look at Monday’s definition or research some on your own. I love reading the numerous variations of definitions on grace! But God has graced you immensely in this area ________________. Write down those graces, gifts, talents and skills. Then, pray, ponder and write again. Ask the Lord how He can use what He has graced you to do, not only for His glory (the most important use), but how you can do it full time? I thought I’ll do my favorite passage. No….this is about her! Ok, the Lord blessed me with a passage on union and love that is the core of my own marriage. So I consecrated that to her new Chapter Change, the the Lord gave me more, so I followed His Spirit. The finished product was amazing in my husband’s opinion. But I wan’t too in love-I surrendered my perfectionism and what I thought it had to look like, you know the photos of Bible Art on Pinterest. But what God took me through, was a time of worship and grace. 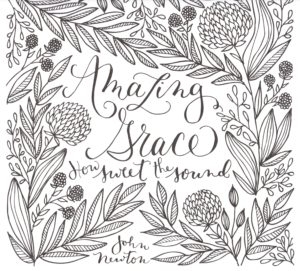 You see the reason why I love Praying in Color is that we GET TO meditate on Him, or the people we are standing in the gap for, or simply, we just want to color because it is relaxing and sometimes we just don’t have words but NEED to get in His word-even if that means scribbling on His very promises. My Praying in Color wasn’t about me. It was His grace coming through the pencils. He used my gift to glorify Him and bless someone else, these two things are what satisfies the soul. I invite you to do the same. Jennifer Tucker is providing the artwork, John Newton is providing the words. (Author of Amazing Grace) So, even if this is your very first time, this will be easy peasy! 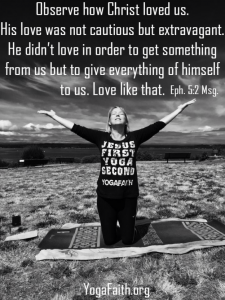 Use YogaFaith’s Soul Shine Playlist, I would recommend you play this while meditating on His grace, and your purpose, but of course you can use your favorite worship or instrumental music. Quieting your anxious thoughts and heart and allowing your soul to shine because of His magnificent grace! During Your Weekend: Think about all the elements of grace that you have learned, how God has spoken uniquely to you during the week’s activities. 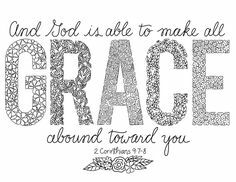 Continue to walk in grace, be a vessel of grace and practice extending even more grace to those that cross your path this weekend. 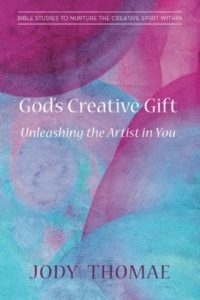 I would definitely recommend her book, we are half way through this Virtual Bible Study and I kid you not, this book has awakened my creative spirit to my Creator’s Spirit like it hasn’t been in a very long time! I’ve been thinking a lot about grace lately. The grace that has been fully given me, but I have trouble receiving fully. To some extent, we all have a “fakeness” about us. Things we want hidden and not exposed for what they are. If Paul can say the things he should do, he doesn’t, and the things he shouldn’t do, he does, I think it’s safe to say we all struggle. As I come out of hiding, the more free I am to receive grace. I open myself to accepting, trusting, and loving a God who loves me, wants the best for me, and who floods my dark, hidden places with the light of his grace. And the more I am free to accept His grace, the more I am free to extend grace. God, in your greatness of love and grace, you gently reveal the ways I hide. And then instead of condemning me, you take my hand and lift me out of a pit of guilt and shame. I long to fully receive what you fully offer. I long to offer to others what you have offered to me. Come, Lord Jesus. Continue to come. Ask yourself: What strongholds keep you captive, hold you hostage from freedom in Christ and what He needs you to be doing? Four years ago I found myself in a new season of life; unexpectedly retired so that I could care for my two moms… My husband’s mom – Avis, and then later that year, my mom – Ginger, also moved in with us. 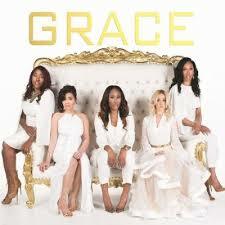 I needed GRACE! Every day I looked for ways to let graceFLOW out of me. I quickly realized how much kindness matters. Everyone wants to be treated with kindness. 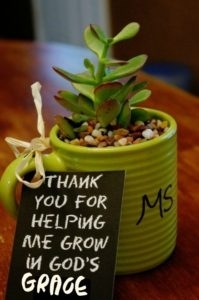 It makes us feel special regardless of our age. I hung this sign in my special place so that I could remind myself daily of my new role. Once I adjusted my pace, I was able to relax and enjoy this next part of my journey. The change of pace actually helped me to renew and refresh my spirit. I now hope to be able to age as graceFULLY as Avis and Ginger have and it has been a blessing to be part of this season of their lives. I’m also sure that’s what God intended for me! Plus I found time to follow my heart’s passion through YogaFaith ! Choose one person you know, one person you don’t know, and do something kind for them… and don’t let them know it was you. Let graceFLOW out of YOU! Do you have a few EGR’s in your life . . . you know, the ones that Extra Grace is Required to deal with? The world, and particularly the Church is full of EGR’s. How can we extend to them the same grace that has been extended to us by Jesus Christ? Humility. When we remember the extravagant grace that has been lavished on us in our unlovely and sin-filled condition, it should bring a humble spirit that is quick to offer grace to others. Who are we to stand in judgment of others and decide who is worthy of grace and who is not? Philip Yancey’s definition of grace: Grace means there is nothing I can do to make God love me more, and nothing I can do to make God love me less. It means that I, even I who deserve the opposite, am invited to take my place at the table in God’s family. 2. Imitate Christ. Watch how Jesus loves the unlovable in the Gospels. Learn from Him and imitate Him. Jesus had a reputation for being the one who loved sinners. By loving those that are difficult to love, we show God how much we love Him. 3. See Christ in each person. If we truly look someone in the eye and see them as Christ’s special creation, stopping to listen and learn their stories, our entire perspective changes. Some of my good friends started out as people that rubbed me wrong like sandpaper. But when I got to know them, I loved them for their differences. A Prayer for Today: Jesus, would you give me the grace to love as you love, extravagantly and purely. Help me love those who I find hard to love. I want to see them as your precious creation. Think of one person that you frequently try to avoid because they rub you the wrong way. Now ask God to help you intentionally approach them this week and extend grace is some small way, perhaps writing them a note, taking time to ask them, “what’s your story”, or buying them a cup of coffee. Pay attention to the grace God extends to you as you practice grace-giving. Oh, visit the earth, ask her to join the dance! I love The Message translation of this psalm. When I read Psalm 65 in other translations, I am tempted to pass over it as antiquated words celebrating a harvest long-past. While the harvest was especially important for the ancient people of Israel, I suppose the modern-day fast-food “connoisseur” in me is not as moved by this hymn of praise. Yet this translation beckons me to slow down and to experience it in a whole new light. The photo above was taken by my friend Heidi. She had asked me to meet her at our local state park to take some photos that would allow her to play with light, movement and color. Dressed in my dance attire I stepped out of my car, just slightly self-conscience of my appearance. I mean, who wears white, flowy dresses to hike the trails? But soon we got started, and I danced away my embarrassment as we began this creative experiment immersed in the beauty of God’s creation. After taking many photos near the chapel there, I suggested we move our shoot to the river. I stepped gingerly into the cold water—with sandals on so as not to hurt my feet on the sharp rocks below the surface. I “danced” the best I could, trying to avoid splashing the water up on my dress. I kept to the edge—not wanting to wander out too deep—all the while playing it safe. Later I visited Heidi at her studio and was amazed by the images I saw. I was captivated by the way the light created orbs and rays over head. I know that low light is normally a photographer’s best friend, but in this case, the opposite was found true. The light created a transcendence to the images that we both found mesmerizing. Psalm 65 is labeled by the Hebrew writer as a shiyr and mizmor, a combination of psalm and song, or according to Charles Spurgeon, “A Lyrical Poem,” which meant it could be read or sung. In the original language, God is pictured as surveyor, overseer and care-taker of the land. However, in Eugene Peterson’s translation He is pictured instead as the ultimate Renaissance artist—creator, painter, decorator and dancer, all in one! The early church theologian Origen believed that in the verses above the psalmist was foretelling “the gracious outpouring of the Holy Spirit, and the conversion of the nations of the earth to Christ.” God’s Spirit being poured out lavishly upon the earth and covering the land! The God-river is filled with Living Water! Yet there I am, in the picture above and in my life, playing it safe, afraid to venture too far in for fear of being swept away. And I know I am not alone in this fainthearted hesitancy. God’s river teaming with Life, and we dance cautiously at the edge afraid to get wet. His light shines over us as we look down below the surface for fear of sharp, rocky places. God is inviting us to join in the dance! To shout, and shout, and shout! To sing! Yet we keep quiet, still, motionless, with our songs lodged in our throats. The Prophet Ezekiel was shown a beautiful vision of a River of Healing flowing from the Temple in Jerusalem. Ezekiel lived and prophesied during the exile of the Israelite nation, so he was prophesying about a future river that would flow from a restored Temple in the New Jerusalem when their enemy Babylon no longer held them captive. The river starts as a trickle—ankle-deep—but it soon rises to waist-deep, then deep enough to swim in—over the head!! The Apostle John also writes of the River of Life flowing from the Throne of God in a future New Jerusalem when the Lamb of God is seated at the right hand of the Father in heaven. These Rivers, which represent the Spirit of God, bring life, healing, fruit and restoration wherever they flow. Psalm 46:4 says: “There is a river whose streams make glad the city of God, the holy place where the Most High dwells.” Let us dance in that river, O Lord! The River of Life that flows from the throne of God! That is where we want to be—to dance, to shout, to sing! Banish our fears! Help us to wade deeper in—ankle-deep, waist-deep, over our heads! Even more, to dive in and under, into the rush of your Living Waters. Yes, deeper, Lord, deeper! We will dance, sing and shout of Your glory, O Great God! If time allows, watch twice. The first absorb whole worship, and complete surrender. The second join me, or simply flow in His grace with your own body prayer. Today, ponder what we have learned about grace in the last few weeks. What has deeply resonated with you? Think of a craft that resembles the grace lesson that has touched you the most. Do this craft/project today and into the weekend, perhaps by yourself meditating on the great gift of grace, or include a friend or your family. I have included a few photos of inspiration. 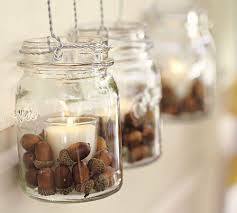 I love them all for different reasons; the acorns in the candles remind me of how something so tiny can turn into something so large and rooted because of God’s miraculous grace. 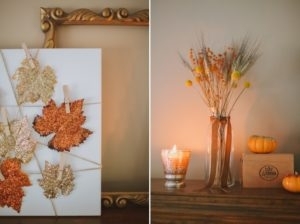 I love the earth toned pumpkin centerpieces wrapped in dead sticks. It reminds me of the hidden beauty that comes from something dying, this center piece will remind me of our Falling Into Grace, as does the others. 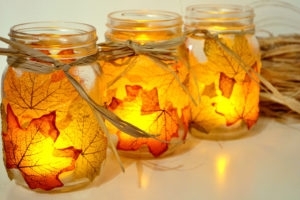 I also love the fall leaves with a bright light coming from within. 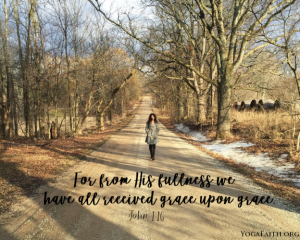 Falling Into His Grace..….what will remind you of this? As you use your hands to meditate and make something for your home that reminds you, perhaps to have Extra Grace as Michelle Tornetta reminds us to, or to constantly Flow in His Grace as yesterday’s video described. Enjoy this time alone or with a loved one. 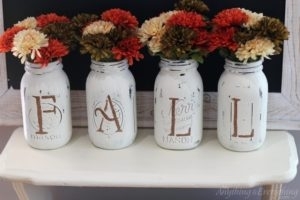 Google DIY Fall Crafts or Grace Project if you need inspiration, find a project that speaks to you based on the best grace lesson you have learned so far in these 3 weeks. 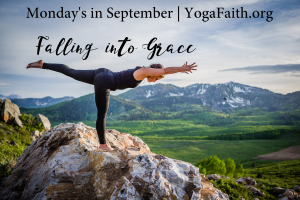 #fallingintograce #yogafaith Don’t forget to share so others can enjoy grace lessons to! Receiving Grace for yourself sometimes I find it easier to extend grace than to receive it or grant it to myself. This is most evident when I have sinned or wronged someone and asked for forgiveness. They forgive me. But now the hard part, am I able to forgive yourself? My daughter teaches me grace every day. She had a stroke at birth and has physical and mental disabilities. She is now 20 and beginning to try out different jobs. She also loves to do yoga. I see her on her mat, watching others, but feeling free to modify her poses to work within her limits. Occasionally she falls over. When she messes up, she is not embarrassed and she does not give up. In fact, she laughs at herself and gets right back up with a smile on her face. She teaches me how to grant myself grace. Father, I know you love me. Help me love myself the way you love me. 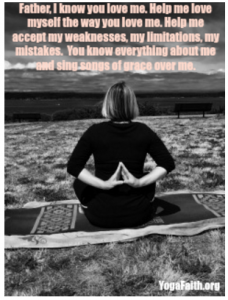 Help me accept my weaknesses, my limitations, my mistakes. You know everything about me and sing songs of grace over me. Most of the time, we can accept that God loves us right where we are at, in our present state. The question is, can you love yourself exactly where you are at in your journey? We all want to change something about ourselves. Can you extend grace to yourself today and rest in the place you are currently at, not wishing you were different, better, or somewhere else along the road? EGR Part IIAs I have been reading and contemplating these past couple of weeks about grace, my mind wandered to a time, quite a few years ago, when I lived with roommates and we were trying to understand the concept of grace and all of the people we encountered that needed Extra Grace Required as we learned from Michelle Tornetta in last week’s series.So what do we do when EGR’s cross our path? How do we respond? It’s with the people and situations that I find most taxing, that I realize, I do not have a lot of other options, than to practice, Extra Grace Required. That extra storage of grace does not come from myself, but from God. It is God who gifts me, gifts us, with this supernatural ability to be patient, understanding, forgiving, compassionate, empathetic and loving beyond what I naturally, or humanly, could ever muster up. The catch is, I need to ask him to help me in times when Extra Grace is Required, and the reality is, he always does! 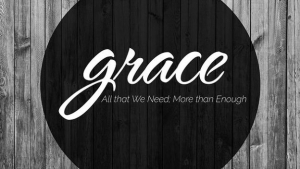 And further still, as I have been reflecting on this idea of Extra Grace Required, I have shifted my perspective from years ago and I notice that, I too, am so many times in the position of Extra Grace Required from those around me. I am in the position of receiving Extra Grace from God himself. So many times I am needy, whinny, awkward, annoying, complaining….. And yet, I can go to God and he always has more grace for me. God does not let me remain in my immaturity, but he is never dismissive of the state that I am in. Through His Grace, not only am I saved, but I am loved and accepted. I will never be perfect, I will always be in need of grace, but I have the assurance of his grace to propel me forward and onward; out of my whining, complaining, needy self, to become the person God has created me to be. 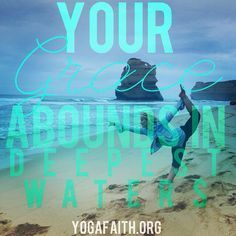 Lately, on my yoga mat, I have been thanking God for his grace, it is sometimes so hard to grasp. I have been desperately asking God to help me extend extra grace to those in my life whom I am challenged by. 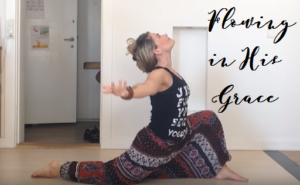 As I move through poses on my mat, I am reminded of the beautiful flow of grace in an through me. God pours it in, so I can pour it out! Have a conversation with God about these questions: Who in my life is an EGR? Whom may I be an EGR to? How is grace practiced in, and through my life? 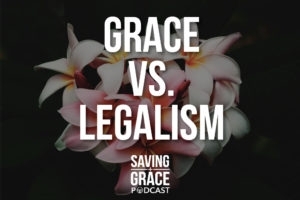 How can I begin to better understand the un-human, un-natural concept of Grace? How can I more fully accept the grace that God extends to me? 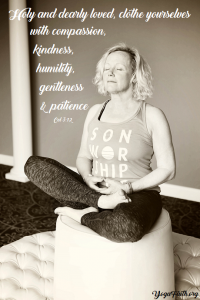 Graceful Yoga-Put together five yoga postures that somehow represent grace and practice them as an act of GRACEfull flowing worship to God! Grow in grace and in the true knowledge of our Lord and Savior Jesus, the Anointed, to whom be glory, now and until the coming of the new age. Amen. Meditate on this scripture today, “chew on it” all day. Allow it to be absorbed into your mind, body, spirit and soul. 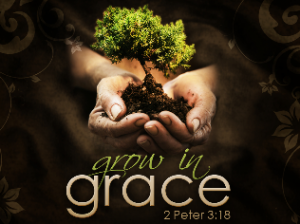 How can you grow in grace from here on out? Align everything throughout your days to the “true knowledge” of our Lord. Take a moment to gaze upon this bridge. What do you see? If I was to ask you what takes you OVER In times of trouble, despair, fear, disappointment, grief, illness what might you say? When you come to those bumps in the road, WHO or WHAT carries you OVER?How do you get from POINT A to POINT B? 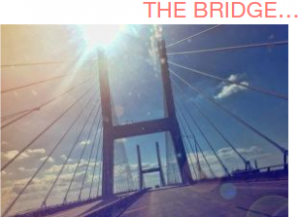 Who or What is the BRIDGE in your life that holds you up, keeps your feet out of the miry clay, mends your broken heart and allows you to keep moving without interruption?I’ve always loved the Bay Bridge as you go around MOBILE. I was lucky enough to catch this shot coming home one time. I love all the architectural aspects of this bridge. The huge steel cables connecting the TOP of the bridge to the actual road. Reminds me of the Great strength that GOD has to hold us UP. #‎carryusinourtimeofneed‬. If you look really close you will see two big H’s. Another piece of architecture that is pretty cool. Honestly I didn’t even see those while taking the picture cause I was driving with one knee with camera in hand. I only saw them after getting home and uploading the picture. Isn’t that how GOD works sometimes. He is right in the middle of our situation. Carrying us, holding us up, protecting us from things. Sometimes we are aware of His presence and sometimes we are not. Many months have gone by since my heart was broken into. Since God called Dennis home. In seeking God everyday I find myself looking at situations different, I look at people different, I find myself looking at church different, my communication is different. Lets just say ‎MY ROADS ARE DIFFERENT‬. After watching this video, ponder and/or journal the evidence of God’s grace in your personal life. Were you once lost? Are you still lost? Would you like to be found? Healed? Free? Or if you have overcome and know that you know that you are no longer lost, who can you help “find”? Challenge yourself to make an effort to “find” others by being the hands and feet of God….every single day. Our next series will be in January; Our annual Be Still Challenge.Coupled with The Daniel Fast is a life altering 30 days. Don’t miss it! Thank you for being a apart of our Falling Into Grace Challenge. We pray that God revealed His extraordinary grace in new, magnificent ways! We love you, the YogaFaith Family. Grace with TD Jakes, Listen here, perhaps with eyes closed or laying down, or “flow in His grace” for 1 minute and 37 seconds.